With that title it may seem odd if I tell you I’m sitting in Wetherspoon, one of a large chain of pubs where they open early in the morning, have free WiFi and serve good (Lavazza) coffee which is cheap: £1.30 for a double espresso (which is what is in front of me as I write this). They also serve a ‘large’ English breakfast for £4.99 if you want it. I do not, I ate my usual raw oats with milk at home. It is, in fact, the first day of school for Petronela after the summer break. She resigned from the school she had been at for 11 years before we went to Romania as, among other reasons, there seemed little opportunity to teach history, the subject she loves and her speciality, though she taught Humanities, Religious Studies and Citizenship as well as beginners’ French, even a little Geography, there. Time to move on so she has gone ‘supply teaching’, in the UK that means filling in for teachers who are absent for some reason, and this week was the first time a requirement for a fully qualified history teacher had come up. At the moment it is just for this week. As the school is difficult to reach by public transport from our home, I’m the taxi driver. 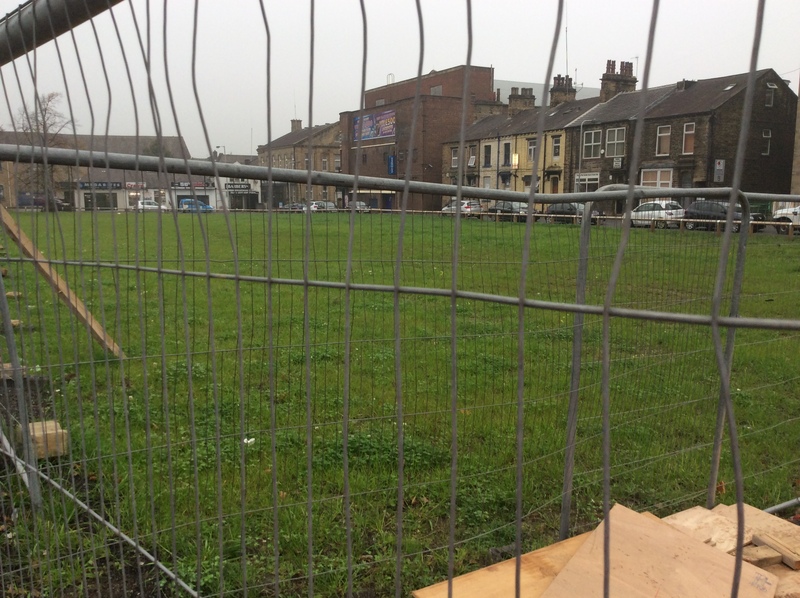 It is, people might think, a coincidence as Wetherspoon is just across the road from a green space which was, until recently the building in which I went to school – Keighley Boys’ Grammar School. The school has not existed for many years but the building was demolished only in the past few months. There are a few more ‘coincidences’. 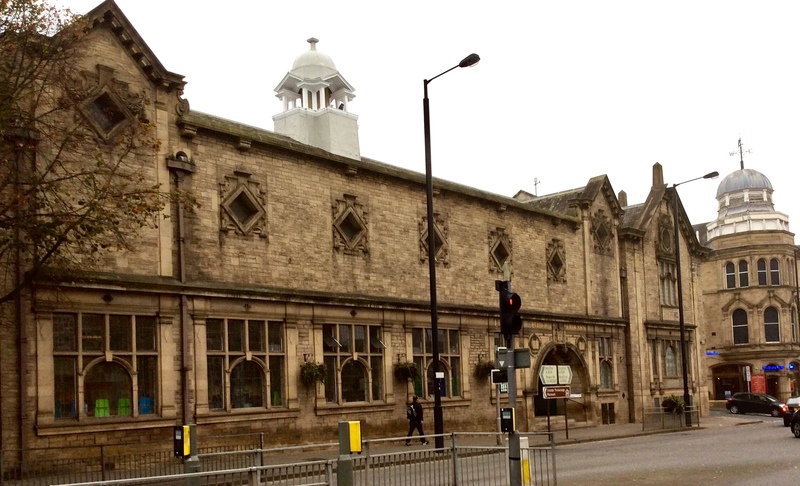 The grammar school was housed in what was the ‘Mechanics Institute’, a magnificent building with a Big Ben type clock tower, built in 1870. A large part of that was destroyed by fire and the wonderful clock tower fell down but, I assure you, I didn’t do that despite my notoriety for building a smoke ring generating machine to disrupt lessons. Anyway, the fire was long after I left. For this week I’ll probably not go home but stay in the town until Petronela finishes, either in Wetherspoon or the magnificent library next door, which also has WiFi. I used to escape to this library when I played truant from school – a frequent occurence in later years when I disliked school intensely – particularly history (!) and French. I loved maths, physics, English (language, not literature, two separate subjects) and art so attended those lessons diligently and did extremely well in final exams in those subjects. French I had ‘dropped’ earlier when I refused to go to school unless I was allowed to do so. But the history exam was my glory day. I wrote my name and details as required at the top of the paper, waited the regulation one hour without writing a single word then left. The headmaster was my history teacher; he went apoplectic, even berserk, and I had to go into school on a Saturday morning and sit the history paper; quite pointless of course. There must have been something wrong with the teaching as later in life I set up and ran a history society and, of course, married a history teacher. Another ‘ coincidence’: my high school was created when a forerunner of the school where Petronela has just gone to teach, a little out of the town, was moved into the Mechanics Institute. Finally, I sat down with my coffee not taking note of my surroundings, looking at the space which was my school through the large windows in front. 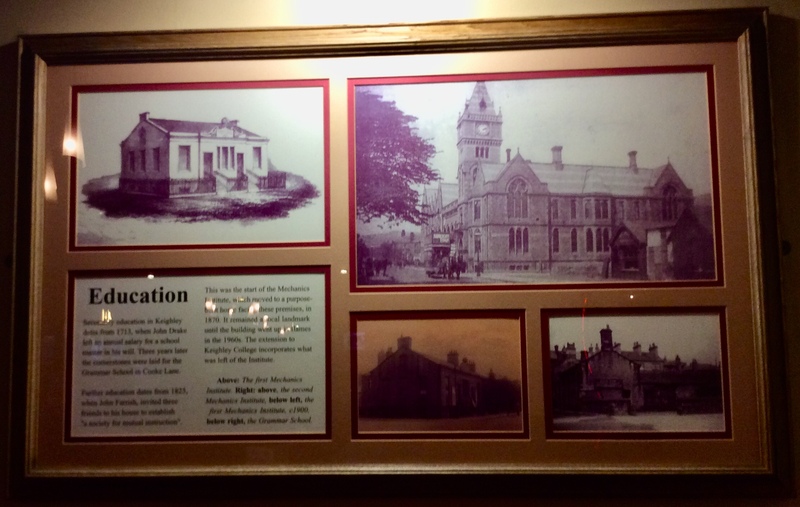 Then I noticed the ‘picture’ on the wall to my right, featuring photos of the Mechanics Institute and forerunners with a little information about it and the ‘grammar school’. As I’ve probably said before I do not believe in coincidence, so await what comes next. I love that library!!!! Beautiful! Now you have the opportunity to show us Wetherspoon!